You are here: Home � All Deals , Beauty: Health Watches Jewelry , Featured � 770 Wipes Pampers Baby Wipes with a Baby Fresh Scent for $12.67 shipped free. 770 Wipes Pampers Baby Wipes with a Baby Fresh Scent for $12.67 shipped free. 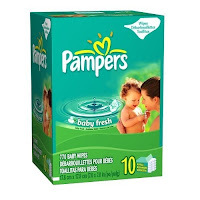 770 Pampers Baby Wipes with a Baby Fresh Scent are on sale at Amazon.com for $12.67 when you select "subscribe & save". Subscribe and save signs you up for reoccurring shipments, however if you don't want receive wipes long term Amazon.com will allow you to immediately cancel your subscribe and save setting - without penalty. Personally in cases where the subscribe and save option can save cash I purchase the item and then instantly cancel when the order is processed, without problem. Click here to check out this deal.